One: Levitt is BYOB friendly—but leave the glass at home. You can bring anything you want to eat or drink to the Levitt, including alcoholic beverages, as long as you don’t bring glass containers. On the other hand, airtight sealed containers (think Pringles cans) are highly encouraged. They help keep your seating area clean and also discourage critters and crawlies from sneaking bites of your snacks. Bahama Bucks (serving snow cones like the ones reviewed by our own Nikki Stephens). Two: Arrive early. Park smart. You can check out a parking map (which includes current downtown street closures here. Guests in wheelchairs should use the ground level entrances at Center and Abram, Center and South and Abram and Pecan (near the flagpoles). The best parking for summer 2018 will be located south of the Pavilion due to Abram St. construction. 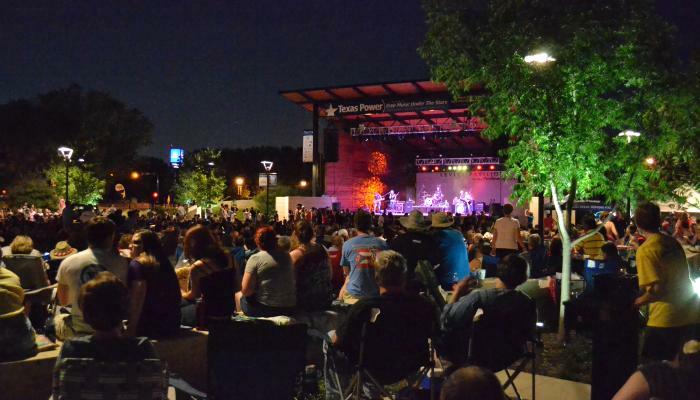 Three: If you’re rockin’ the Levitt, make a weekend of it! With so many cool things to do in and around Downtown Arlington and two charming bed-and-breakfasts practically within walking distance of the Levitt, why not turn a concert into a staycation? Learn more. Four: Blankets and lawn chairs are encouraged. Some Levitt guests prefer lawn chairs for better visibility, while others like to sit or lay on blankets. Until you get your Levitt routine down, you might want to bring both. The Founders Plaza lawn is where most people sit, but guests are also permitted to perch on the low walls around the lawn, too. Six: Don’t worry, bathrooms are on site. Due to construction, City Hall bathrooms are currently not available for use. However, the Levitt provides port-a-potties on site, as well as a new air-conditioned bathroom trailer. Seven: Stay in the loop. If inclement weather takes center stage, you can find out about delays and cancellations by calling the Levitt’s 24-hour info line at 817.543.4301 or by downloading the Levitt Pavilion app. Eight: Well-behaved dogs are welcome. Friendly dogs on leashes are welcome to join the fun, but know that you’re responsible for cleaning up after your pet as well as your pet’s behavior. Before you leash up your favorite furball, please think about whether or not the show will be too loud for canine ears. Nine: If you’re smoking, you’ll need to leave the lawn. There’s no smoking in Founders Plaza, the rules say no smoking or vaping within 50 feet of a city park. Ten: Bring your favorite band’s CD for an autograph. Although the Levitt can’t promise that any artist or band will be available for autographs, many performers do stick around after the show to sign CDs and meet and greet with their fans. When that happens, it usually takes place in the merchandise tent that’s close to the stage, after the concert. No one is allowed backstage.